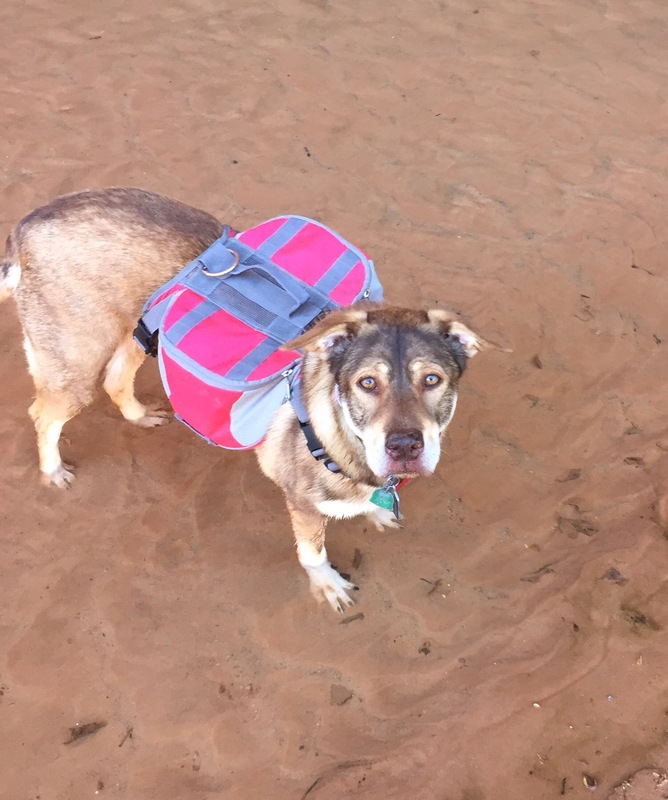 While I’ve done quite a bit of solo hiking, Grand Escalante National Monument would be my first solo, actual backcountry trip, and Cocoa’s first major hike. This is the story of how I ended up doing the majority of the hike both barefoot, and commando. For any that aren’t the hiking type, the you can think of ‘backcountry’ camping as camping that you cannot drive to. Typically there are no facilities (restrooms, trash cans, food, etc) so you must pack in all that you need and pack out everything that you take. Sometimes there is water available to filter, other times you must BYOB. Sometimes there are marked camping areas, other times you are free to setup camp wherever you’d like. And sometimes, the trails are marked and other times its a free for all and you can explore wherever you fancy. 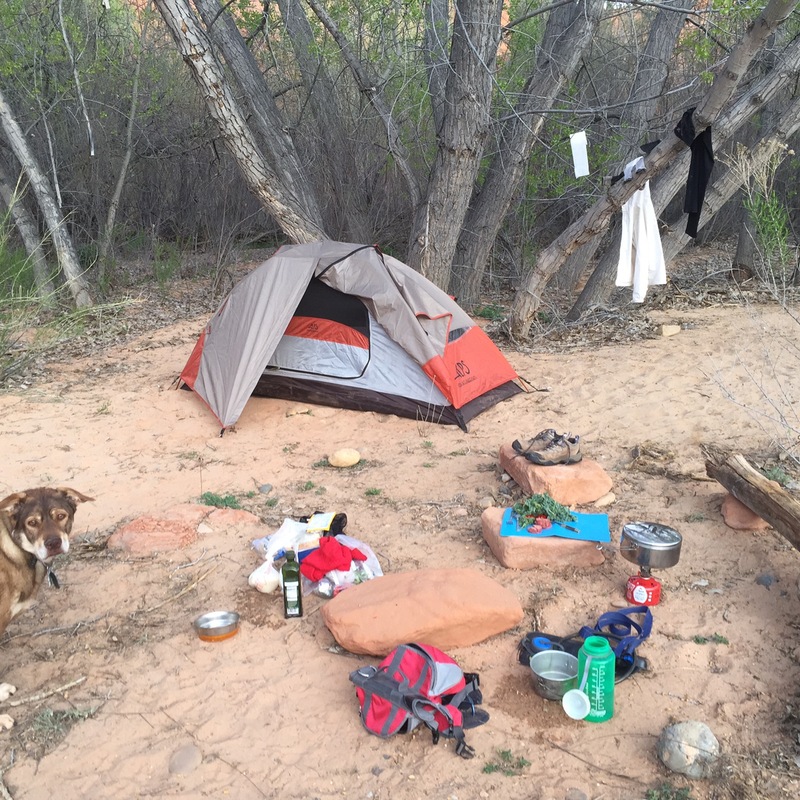 Grand Escalante is a massive space in southern Utah with miles upon miles of dog friendly, backcountry trails to explore. My initial plan was to drive down from Capital Reef National Park, spend a day car camping, and get the chance to talk to some other folks and the rangers about the best hikes and routes. Must be a bit longer than what I could do in just a day, but not too long (so, more than 10 miles, but less than 6 miles/day). My logic was that if I could do it in just a day hike, then why bother carrying all the camping stuff? Must be easily navigable; without a GPS (or phone service) I wanted something that I could feel confident I wasn’t lost. Unfortunately, there were no vacancies at any of the car camping sites along the road. So, I continued on to the visitors center to find it packed with folks asking questions and getting backcountry permits. I tried to tell the ranger what I was looking for, but she was a bit surprised that I had no idea which route I wanted to take or even what part of the park I wanted to explore. I randomly chose one of the many options she listed, filled out a permit, signed off on it, and was supposedly good to go. 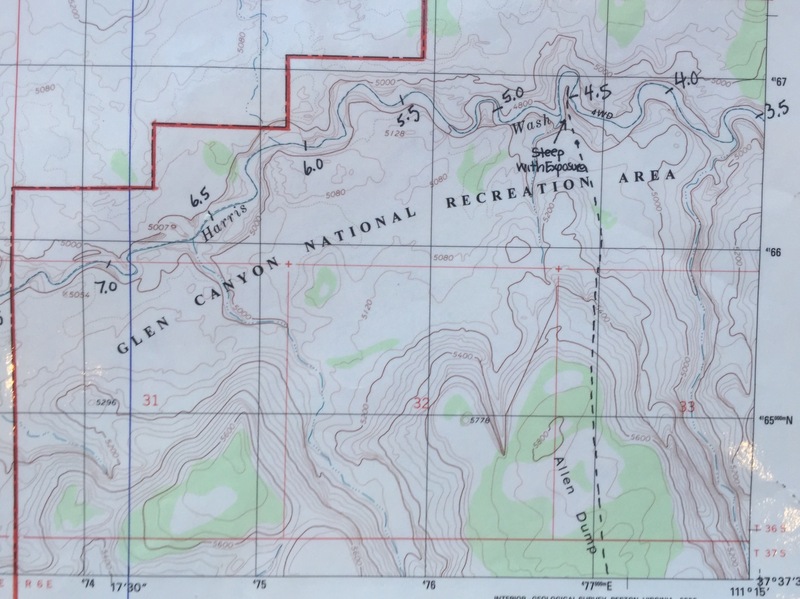 Topo map of the trail I’d end up taking; Glen Canyon is adjacent to Grand Escalante. The numbers signify miles; the trailhead is just to the left of the map. But I didn’t feel good to go, I felt unprepared and lost. I hung around and studied the technical maps and guide books specifically written for the area to hopefully gain some confidence in my haphazardly thrown together plans. After some more research, and after the crowds died down, the ranger returned to ask if I’d figured out where I’d like to go. I chose one of the slot canyons (Google ‘slot canyons’ to see why, they’re gorgeous) that would be a shorter, easier path (less than 10 miles) and not too far from a car camping option if I chose to do that for the night. The ranger and I talked some more, I solidified my plans, asked my questions, and set off for the trailhead. Shortly after turning off the main road, I encountered a large sign that read “Absolutely no dogs allowed in Coyote Gulch“. There were roughly 10-15 trailheads off this dirt road…was I going to Coyote Gulch? Why wasn’t there a map anywhere with Coyote Gulch on it? Was a coyote going to eat Cocoa? Didn’t I mention the dog thing? Why doesn’t T-Mobile have service anywhere in Utah, dammit?! Back to the visitor center. 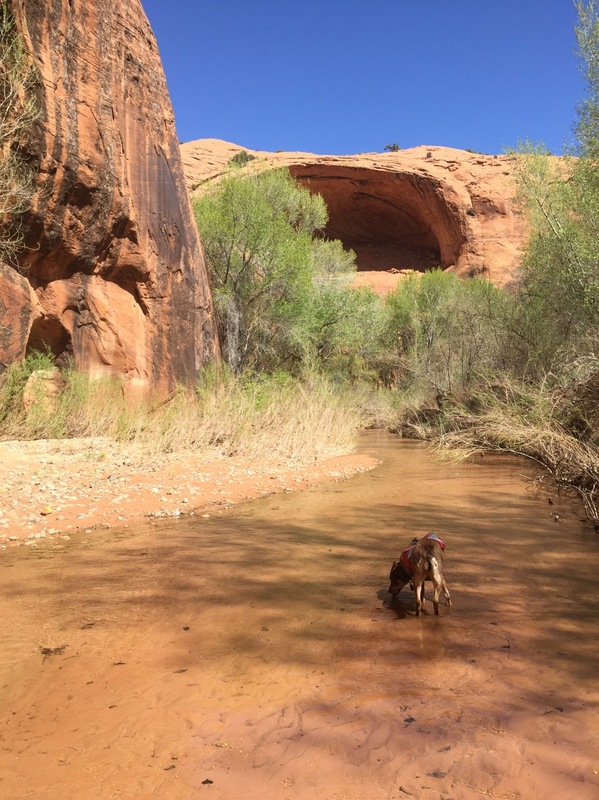 The second ranger informed me that while my itinerary wouldn’t be taking me to Coyote Gulch, the trail I’d chosen was not recommended for dogs because of a 10 ft. tall scramble at the beginning of the trailhead that most dogs could not climb. 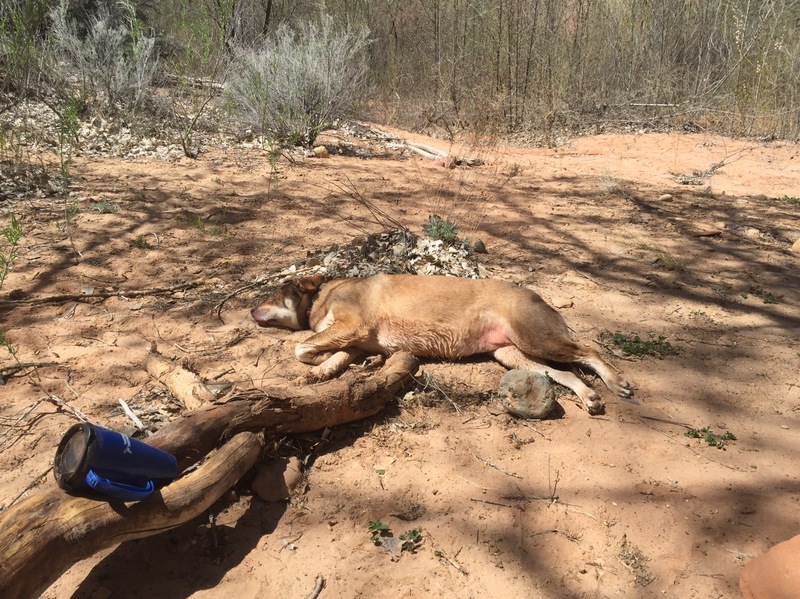 She recommended Harris Wash instead as an easy, beginner hike with pups. 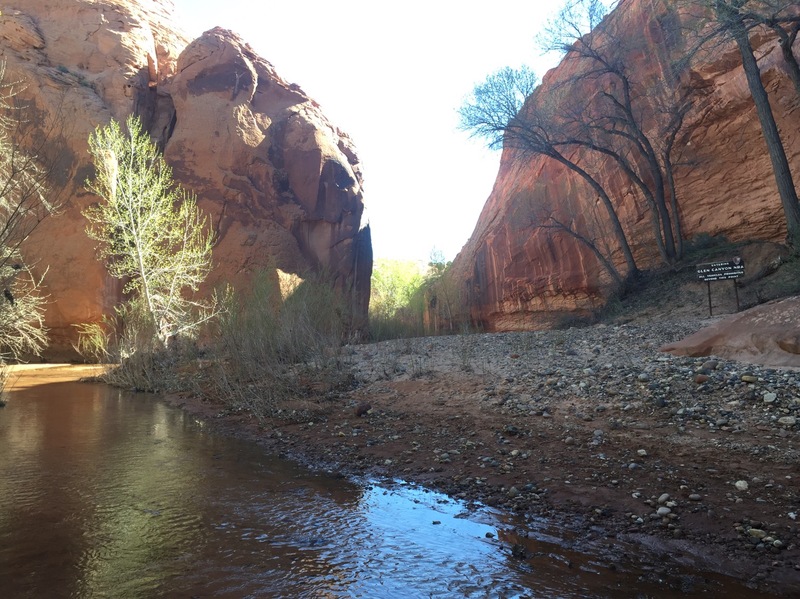 Rather than rely on my iPhone pictures of maps or navigation skills (there are no trail markings in the backcountry of Grand Escalante), she told me you can just follow the wash up the Escalante river. (Side note: a wash is basically a small riverbed/creek, sometimes with water and sometimes dry, but really easy to discern amongst the surrounding landscape). The wash, and “entrance” to Glen Canyon Recreation Area from Grand Escalante National Monument. I set off again, drove 10 miles down a gravel road and then another 6 down a dirt road to arrive at the trailhead by 4pm. I spent a good two hours sorting food, getting my gear together, and packing everything up before setting off for the trail. One nice thing about Utah, is that the sun doesn’t really set until 7-8pm, so my late start still allowed for a semi productive day of hiking. The trail was, as the woman promised, super easy to follow. About 500 yards from the trailhead, I ran into the wash. The first two miles were through stock lands, with some disgusting looking water in the stream and quite a bit of cow poo. After just less than 2 miles of hiking though, the terrain became more wooded, small canyon walls arose on either side, there was a healthy amount of clear water flowing in the stream, and sufficiently less cow poo (win!). I set up camp for the night with the sun starting to set along the banks of the stream, excited to have made so much ground, and feeling a little eerie about being totally alone (with Cocoa, of course). Cocoa modeling her new pack! Now, I always pack light on clothing when doing these multi-day hikes, even when I’ve got a place to stay. So, with all my camping and cooking gear, food, and some water in my pack, I was really skimping on the clothing. But I didn’t intend to forget underwear. I just did. The thought did occur to hike back to my car, grab the forgotten articles, and then hike back, but it wasn’t an enticing one, so I pressed on. Oh well! If you’re like me, you take all precautions and warnings from any government service with a grain of salt. Its their responsibility to protect the public, they don’t want to get sued, I get it. But I drastically glossed over a one line note on the hikers guide of “you will be walking in and out of ankle deep water the whole time.” Within the first 10 minutes of the second day, my shoes and socks were soaked through and slopping. My feet convinced me to free them of their soggy prisons and I decided, if I’m just walking through wet sand, barefoot is the way to go. The water was pretty cold, but the canyons on either side made for some great views even if they did block the sun. After another 5 minutes of peaceful walking, I came to the 4 ft tall stock fence that fully blocked the river and ran along the banks to either sides of the canyons. After some mental gymnastics, I decided it’d probably be better to try to cross on the bank, and I tiptoed (still barefoot) up the side of the bank. I found a good spot to climb over, tossed my pack over the fence (which, if you’ve ever been backpacking, isn’t an easy feat), and then carefully climbed over and tiptoed back down through the brush to the stream. On the hike back out, I’d learn that there was a gate on the other bank. Whoops. To say that my step lacked pep is an understatement. After 4 slow miles of slogging barefoot through 4-6 inches of cold water, with a sandy bottom and a sizable pack on my back, I decided to set up camp and attempt the remaining 8 miles (4 there, 4 back) as a day hike. Camp. I’ll resist a clever pun about the tree in the background, but see if you can guess it. Cocoa and I made it about another 2 miles before the thought of 2 more to see a river just wasn’t enticing enough to continue. Cocoa was lagging, even without her little doggy pack. And I’d seen rivers. Heck, I’d seen the Colorado a few days ago. There is no way this could be as cool as that. I ate a Snickers and turned back for camp, a little defeated but excited to get out of the damn sand and rest. For anyone that claims they like long walks on the beach, I don’t believe you. Cocoa had no problem passing out immediately when we got back to camp. One nice thing about Harris Wash, is that it was remote. Over the three day hike, I only saw four other groups of people: one group doing some sort of conservation work (I assume, they were chainsawing and looked young and official), one family, one really large youth group, and then a couple from Seattle that I ran into when I got back to camp. They were super friendly, also lamented about the sandy paths, and recommended some good hiking along the slickrock instead. The morning of the third day, I awoke early to hike the 6 miles back to my car. It took some doing to convince myself to keep on my wet shoes and socks, but visions of the cow poo on the other side of the stock fence were more convincing. Now, finding the wash from the trailhead is easy; its a giant dry riverbed about a quarter mile from the trailhead that you can’t miss. 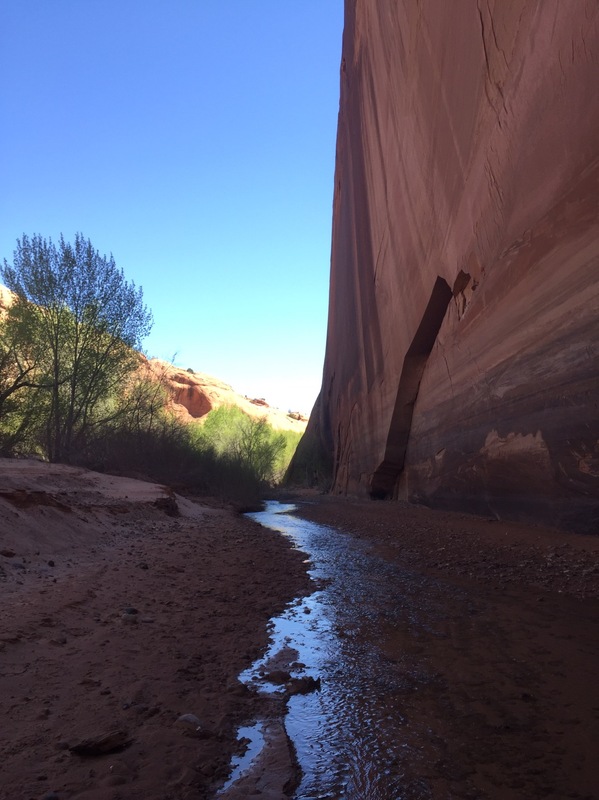 Finding the trailhead from the wash…less so. Luckily, I ran into the couple from Seattle again, who not only provided some nice conversation but also a fancy GPS module to help get us back to the parking lot. Woohoo! Overall, even though the hiking was slow and sloggy, and the views were mediocre compared to the National Park hiking I’d been doing, I’d call the trip a success. I hiked in solo, camped and had some pretty decent meals, didn’t get lost, and made it back to civilization as planned. And, Cocoa seemed to enjoy the wilderness and didn’t get eaten by a coyote, so that’s a win in my book :). Canyons, the wash, and Cocoa on our way out the last day. This reminds me of my first big backpack trip. I went to the Wind River mountains in Wyoming after reading an article about the place in a magazine called Outdoor Life. I was solo because I couldn’t find anybody who would go and just said screw it, I’ll go solo, and I’ve been doing it that way ever since. I didn’t get lost but the first day of the hike was the hardest thing I’d ever done in my life. There were two options from the ranger station which I discussed with the ranger on duty. She asked what I preferred, solitude or not. I opted for solitude and she said to take the trail to Trapper Lake, otherwise it would be like “Grand Central Station.” I took off and found out something she’d forgot to mention, not that it would have mattered–the trail was 2000 feet down, then 2000 up to Trapper Lake. This at an elevation of around 8000 feet. Fresh out of Omaha, I’d have to say it was on the difficult side. I made it to Trapper the next day and set up a base camp and fished successfully for trout and traipsed about some. My experience and knowledge game from reading a book called The Complete Walker by Colin Fletcher. I’ll try to remember to bring it to Omaha and loan it to you. It’s the most famous backpacking book there is and I assume it must have revisions as technology has changed since then making items much lighter and more efficient. Out.